Very few people that ever enter substance abuse treatment or drug rehab do it willingly. Even less enter addiction treatment with a smile on their faces, riding the crest of the wave of life. Most people enter treatment angry, having some external motivation pushing them into receiving treatment. 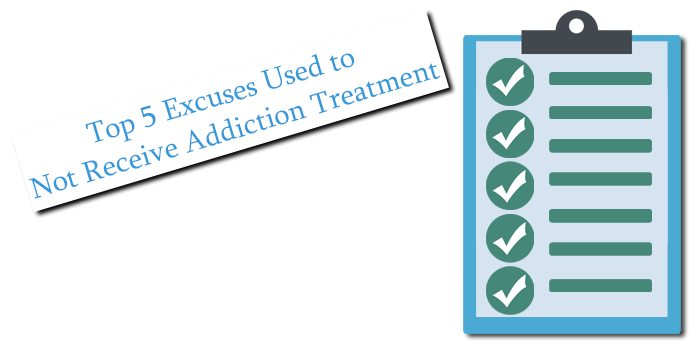 Because of the typical emotional and mental states of a drug addict at the point in their lives when their families and friends are pleading with them to get help for their addiction, most addicts will make any number of excuses as to why they are not able to go receive drug treatment for their addiction. In the minds of the addict, every single one of these excuses are valid. They hold water. They make sense. However, from the outside looking in, the loved ones of the suffering person know the truth: That in the light of a deadly addiction, none of these excuses are important enough from keeping an addict from the necessary life-saving treatment they require in order to overcome their addiction. Addiction, like cancer, is a chronic, progressive, ultimately fatal disease if left untreated. Think of these excuses if made by a person suffering from life-threatening cancer. Would they make sense? Of course not. However, addiction is the only disease that’s primary symptom in denial; a symptom of addiction is that the addict doesn’t believe they are an addict so the need for treatment in their mind often is secondary to other things taking place in their life. Job. An addict will always say that they cannot get treatment because of their employment. “I need my job” or “I can’t go to rehab because I’ll lose my job” are customary responses. First, legally a person cannot lose their job for seeking treatment for addiction. Second, yes you can go to treatment and if you do lose your job you can find another one. Here’s a secret: Dead people don’t work. And addiction is deadly. So treatment must come first. Family. Many people use their spouses or children as reasons not to go to treatment. This seems valid. However, if a mother is smoking crack it’s important to consider what kind of mother she is being to her children. If she is a single parent, she may need help while receiving treatment. Most people will be willing to step up and help care for the children while a parent is receiving the help they need. Remember, it often takes a village. Significant Other. Addiction runs rampant through the young adult population. Sometimes men and women in their late teens to early thirties date and this becomes an excuse and a barrier for getting help. “I can’t leave my boyfriend” or “My girlfriend needs me” are phrases heard a lot from those faced with the decision go to rehab. Again, all excuses. The truth is, if the boyfriend or girlfriend loved the addict, they would ask that they go get the help they desperately need. However, if the significant other is blocking the addict from treatment or if they don’t want the addict to go get help, than the question arises: Are they using together? Why wouldn’t someone you love support you in getting the help that you need? If that person loved you, they would ask that you go to drug and alcohol treatment and then there is no excuse no to go. “The timing isn’t right.” This is another excuse often heard. “It isn’t the right time” or “Right now isn’t right but I will in the future.” Okay, here’s another secret: IT IS NEVER THE “RIGHT” TIME TO GO TO REHAB! No one ever planned their life saying: “And then I’ll graduate from college and then I’ll get married and then I’ll go to rehab and then…” It doesn’t work that way. There is never “the right time” or “the best time”. The only time that matters is NOW. Go now. Getting better and getting healthy and getting clean and sober takes place based on what you do, not what you plan or what you say you are going to do. Change happens based on action. So, in truth, NOW is the right time to go. There isn’t any other better time. Pets. Yes, we know you love your dog/cat/hamster/bird and any other furry or scaly creature you refer to as your child. If you didn’t love your animals you wouldn’t have them. That being said, your dogs or cats or fish are not a reason not to seek life-saving, life-enriching treatment from your drug addiction. Again, someone can step up and watch your pets for the time you are away. Dying from a heroin overdose because of your cat is not a valid excuse to not go get the substance abuse treatment you need to save your life. Drug addiction is a deadly disease. Treatment is often the first step to a beautiful lifelong journey of happiness and peace through recovery. Don’t let delusional or self-made barriers be excuses to seek the help that you or your loved one needs.